Today I was Brian’s Industrious little wife. First I cleaned the house and did a little scrapbooking – plus made a waffle breakfast and BLT sandwhiches for lunch. Then I went to check the garden and a pear tree I’ve been watching. The pears were ready to pick and I got two Wal-Mart sacks full of them. 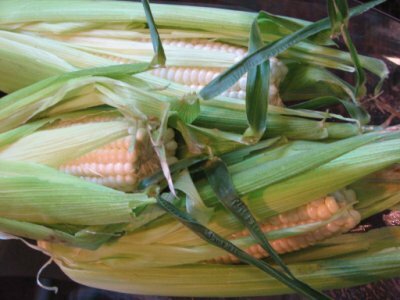 Next I picked corn – 56 ears of it! There’s still about 1/3 of the crop left to pick when it gets ripe. I knew we couldn’t eat that much corn before it went bad so I looked up on the internet how to properly go about freezing it. I thought I would just cut it off the cob and freeze it but it’s a little more involved. 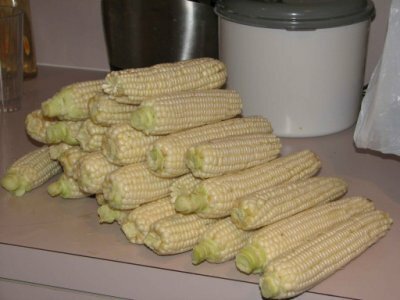 First there’s the shucking and de-silking – I did that out in the garden and spread the shucks out to dry so I can make corn husk dolls later. These ears I’ve actually left in their shuck and hope to roast them tomorrow! These are the ears destined for the freezer. The corn has an enzyme in it that causes it to break down so I had to blanche it (put it in boiling water) for about 5 min. 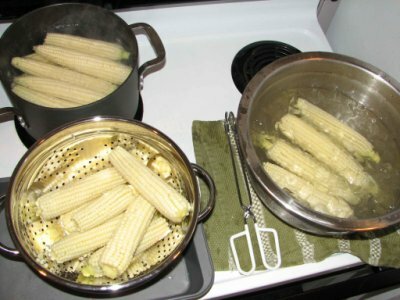 then transfer it to ice water so the corn would stop cooking. It came out of the ice water and into the colander to drain before I cut the corn off. 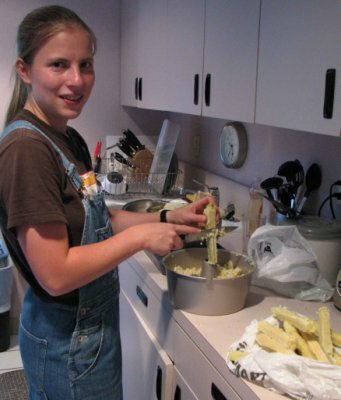 Here I am cutting the corn off the cob. Don’t know if you can tell, but I’m using an Angel Food cake pan. I set the cob on the middle tube and all the corn fell into the bowl. I got this idea from some online cooking tips place. The corn is wonderful, Brian and I sampled it just as you see it there and it’s so sweet and fresh! Can’t wait to grill it!